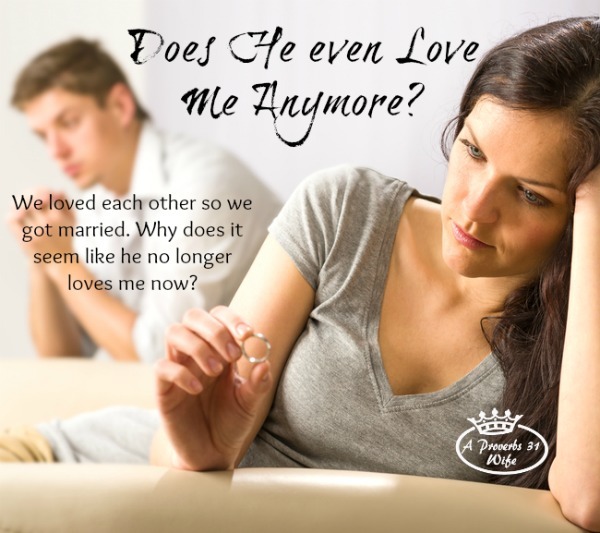 As a newly wed I often asked myself “does he care about me at all?”. I mean, I was all gung-ho for this thing. Reading all the marriage books and learning everything I could towards becoming a good wife. I must have succeeded in pleasing him, because he seemed pretty happy, cared for and well fed. 😉 But I was frustrated. Because here I am, doing everything in my power to please him, and he doesn’t seem to care one stitch about me. I didn’t want to be One of Those wives; you know, the ones who wear the pants in the family, the ones who whine and nag and are never happy. But in all honesty, I wasn’t happy. Today’s post is how that changed. Now I am not referring to the husband who is abusive. I am talking about a situation where it seems like you got married and suddenly the honeymoon is over. Looking back now, I can see a lot of things that contributed to my attitude of feeling like he didn’t care about me. #1. I knew what kind of wife I needed to be. Problem is, I also (thought) I knew what kind of husband Jason needed to be. #2 I expected him to love me the way I was loving him. #3 I’m a planner and get-it-done-er. Jason waits until the last minute. The first time I remember thinking “does he care about me?” was our first Christmas together. I was watching him and paying attention. I knew the things he needed and wanted and was excitedly finding the best deals on everything we could afford for him. He, on the other hand seemed clueless. I was dropping all sorts of hints and asking him when he was going to go shopping for me. He finally went. And bought something. And I liked it. But it was such a bummer because I felt like he didn’t want to buy me a present. Just things like that. I wanted one thing from him, he was something else. I would talk to him until I was blue in the face. Tell him about my needs and ask what I could do better. Somehow I equated him being a “bad” husband to me being a bad wife. He thought I was wonderful, I was everything he ever dreamed. So I would ask why he didn’t love me. Poor guy, he sure was confused at times, because he did love me and couldn’t figure out why I thought he didn’t! I wish I could give some sort of magic solution to other young wives who find themselves where I was. But I can’t really. I didn’t really do anything that changed the situation except give up. I really gave up. In my head I figured he would never be the kind of husband I thought he would be and accepted the fact that he wasn’t changing. Once I stopped seeing everything he was not, I began to see everything he was. Turns out, I have a pretty great husband after all! <-Tweet it! No, he’s not the husband I wanted him to be at first, but he is way better! And Christmas time? Well, I always let him know when we are going to my mom’s to celebrate Christmas (we exchange our gifts there) and then laugh up my sleeve as he procrastinates and waits until the night before we leave and then heads off in a great sweat to buy me a gift! So to you young wives who are asking “does he care about me?” I will tell you that the answer is yes. But chances are, he isn’t going to care about you the way you care about him. Let go of who you want him to be and start focusing on who he is. Matt does the Christmas thing too. When we first met, (and for the first several years thereafter) he was so amazing about the Christmas shopping. He still did it all in one feel swoop and sort of last minute (maybe a week before), but it didn’t bother me because I could tell he loved me by what he bought. He is a man’s man type of guy and he would brave the girly stores at the mall, such as bath and body works, candle shops, jewelry stores, and Victoria’s Secret. The fact that I would get a bunch of girly smelling lotions, candles, home decor stuff, and Victoria’s Secret pj’s , robes, etc. meant a lot because I knew he had to endured being sprayed with the girly smells at B&BW lol. I guess he shouldn’t have spoiled me haha, because then we went through this phase were it felt like he took no thought at all. No more nice malls or girly stores. He literally would go to WalMart the day before Christmas and get me a DVD or something. One year he went to the mall, but he got me things that came from a store he went shopping in for himself (like I got a sports team sweatshirt, and a jigsaw puzzle LOL). Dare I even say he did the same thing when he bought my engagement ring (bought it last minute and it wasn’t planned out really). I don’t know why he went from Mr. Romantic shower me with diamonds , perfumes, and other fancy things to Mr. last minute throw stuff in a cart (or at least that is how it seemed), but I feel ya on the whole gift giving thing! After several holidays in a row like this , and several gracious chats with him, last year was back to “normal” , minus the fact that he has gotten a LOT more practical and frugal now that he is getting older. No more young 20 something extravagance ;). When you have been with someone since you were a teenager, it gets interesting to see the changes in them when they age. I have learned that people do change when they “grow up” and I can’t expect him to be the same as he was when we met. They love us in their own ways though. I am glad you have discovered the ways in which Jason does love you. :D. I never felt like Matt didn’t love me when things started to change, I think I felt like he just didn’t care to impress me now and had gotten lazy. I think love changes and grows just like we do :). He may not buy me a gold bracelet just because to surprise me anymore..but he does little things like picking up my favorite food at the grocery store. Even those practical every day things, are ways they show us their love, huh? Mistakes we all make when we have a set mind instead of keeping an open mind and enjoying our spouses. I had such problems too when I focused on the things my husband is not, until I turned and starting noticing the things he is. Great post my friend, thanks for sharing and hosting, do have a super blessed day! I am sure you have helped many “new wives” today Kendra! I remember way back in the day when I was a newlywed that same feeling. We were young so that did not help. We were BOTH clueless! Once the honeymoon was over it seemed like everything was over! LOL! For us, it helped to literally grow up and realize we needed to focus on just what you said, what each other WAS, all of our good qualities instead of the things that drove us crazy about the other!! Awesome post — very helpful for me today. Thanks for hosting & God bless! I run into similar problems. I know his love language is words or affirmation and I do strive to show him in his language that I love him. Is it wrong for wives to yearn for their husbands to love them the way they know they are loved? Is this saying that as a wife I love him the way he knows he’s loved because I get to know him but he’s supposed to just not try and learn his wife? Why not both husband and wife learn each others love language and strive to show love to our spouses. For me, I give up the fight. 17 years of marriage and he still doesn’t want to try, other things and people come between us. Finding new people on Facebook and keeping up with a bunch of electronic people are more important than a real life relationship. Under no circumstance should a husband not try to get to know his wife. I don’t give them excuses for sure, but I just know in my case I was making it hard on us by expecting him to react to our marriage in the same way I do. His attitude is “If it isn’t broke, don’t fix it” which is a good way to look at things, but he forgot we were only in the building process. I know what has worked for us may not work for others, but one thing that has worked is communication. Not a monolog where I’m speaking, and he checks out after two seconds, but where I am asking him questions. Questions like: Do you think our marriage will last 50 years? Is there some way I can love you better? Do you feel like I love you? and typical male, he didn’t give very deep answers. For the following questions I didn’t expect answers but they made him think: Did you know that I feel like you don’t love me? I know you love me but I don’t feel like it, why is that? I would like to encourage you to not give up on your husband, or your marriage. Perhaps you could somehow join his world and use his interests to bring you closer.